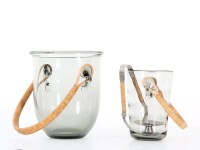 Jacob E. Bang was Holmegaard’s first designer and was first employed at the glass factory in the 1920s. He was really an architect, but after working at the glass factory Bang shifted his attentions completely to industrial design. During his time at the glass factory, he designed a number of products that have now become collector’s items. In 2012, Holmegaard delved into its design archives and found Jacob E. Bang’s vase from 1965. It was originally launched under the name of the Antique Green Range, but is now known as JEB 65.